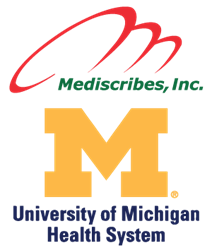 Mediscribes, Inc. gets the nod as medical transcription service vendor for University of Michigan Health System (UMHS), one of the nation’s top ranked hospitals, ranked #1 by U.S. News and World Reports in Michigan and metro Detroit. We are pleased to add The University of Michigan Health System to our medical editing/transcription customer base,” said Terry Ciesla, Executive Vice President for Mediscribes. Diane Repshinska, the University of Michigan's Manager of Health Information Management - Central Transcription Service stated, “Mediscribes was chosen as a transcription vendor by the University of Michigan Health System because they were thorough and detailed during the RFP process, responsive to all questions and requests, and the customer references were eager to speak to us on behalf of Mediscribes and returned favorable results. “Mediscribes is a good fit for us and we are really looking forward to the partnership,” said Erica Foster, RHIA, MBA, the Director of HIM Operations for the University of Michigan Health System. “We are pleased to add The University of Michigan Health System to our medical editing/transcription customer base,” said Terry Ciesla, Executive Vice President for Mediscribes. “The team at Mediscribes is justifiably proud of our selection and we are looking forward to delivering UMHS with an unparalleled level of service, focus and commitment." Mediscribes is a leading healthcare informatics and clinical documentation provider. Headquartered in Louisville, Kentucky, Mediscribes provides intuitive solutions that focus on positively impacting a healthcare customer's entire clinical documentation operation. With a web-based dictation/transcription system, automated workflow includes e-signature, interfacing, printing and faxing. Mediscribes also delivers cutting-edge CAC technology that combines Natural Language Processing (NLP), Machine Learning, Semantic Web, and High Performance Computing. The goal is to put operational data in the hands of healthcare professionals to help them proactively identify patients at risk, patterns in disease and treatment outcomes.